Difference between revisions of "Deinterlacing"
:This isn't really a deinterlacer. It's purpose is to output an interlaced signal to your TV (or projector) and have the TV perform the deinterlacing. If your TV has a particularly good deinterlacer, or you are using a CRT TV then potentially this method can give the best results of all. There are many restrictions on its use. You must setup X with an interlaced display mode that matches the content resolution (at least in the vertical). You cannot use scaling or time stretching. Outdated: The information on this page may no longer be relevant to the current release of MythTV, 30.0. Please consider helping to update it. Deinterlacing is the process of converting traditional Interlaced Video into a Progressive Picture that can be displayed on modern non interlaced display devices such as LCD or Plasma screens. 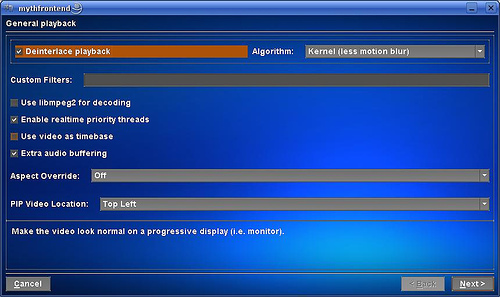 MythTV has several options for Deinterlacing. The configuration options for deinterlacing can be found under Mythfrontend->Utilities Setup->Setup->TV Settings->Playback. On Playback Profiles (3/9) edit each entry, The Primary and Fallback deinterlacer may be set on the 2nd sub-page. See Playback profiles for more information. To custom tune exactly for your system, you may need to just try different deinterlacers to see which look best on your screen and which don't overtax your CPU. If you see signs of tearing (discontinuities in the video), jittery video, prebuffering pauses and your CPU usage is high, you may be overtaxing things. If you see lots of "combing," where moving objects have alternating teeth, you may not be deinterlacing at all. There is a python script available for Comparing deinterlacers. The best deinterlacers will double the frame rate (typically 29.97fps in the USA) to 59.94fps, which is the rate at which the fields (half-frames) of interlaced video occur. For each field, they will build a whole frame. This requires that your display be able to operate at this doubled frame rate. Surprisingly some displays are just a hair below that, in which case Myth will switch to your "fallback" deinterlacer, as set on your configuration screen. Doubling the frame rate requires a lot more resources. Some video comes at 25fps, which doubles to 50fps and should not have a problem with the monitor refresh rate. You may also encounter problems with loss of deinterlacing if doing time stretch. Your TV probably has a fairly good quality hardware deinterlacer. To make use of it, you must have your video card output an interlaced video signal to the TV. This typically requires, in X, a special modeline for the display. Because you will not want to use interlaced output for 720p or 1080p video, you will want to set up MythTV to use different video modes depending on what type of stream is being played. When using native deinterlacing, you would set your deinterlacer to none. You will not be able to zoom, and may have trouble doing time stretch, but you will get quality deinterlacing with minimal CPU. Please note that many people have had problems getting NVIDIA video cards to properly output an interlaced video signal. Some have played tricks, like using a 60 frame per second 540 line mode line, and applying special tricks. These are arranged in (rough) order of preference. You probably want the best one your CPU and GPU can handle. HW acceleration (in OpenGL and inherent in VDPAU) will let you handle a better deinterlacer. Using double framerate (2x mode) will do a better job but cost more resources. This "deinterlaces" by throwing away half the picture. Use only on lower-resolution displays or if you can't do anything else. It is clean, though. This requires SSE support compiled into your Kernel. It blends where things are moving, does not deinterlace where things are stable. MythTV has a number of 2x deinterlacers which attempt to turn 30 Hz (or 25 Hz) interlaced video into 60 Hz (or 50 Hz) progressive video. The aim is to improve on non-2x deinterlacers which look fine for static scenes but create jumpiness when the scene contains motion. Shows first one field then the other scaled to the entire height of the picture. For low- or no-motion scenes Bob 2X discards half the vertical resolution of the picture. This isn't really a deinterlacer. It's purpose is to output an interlaced signal to your TV (or projector) and have the TV perform the deinterlacing. If your TV has a particularly good deinterlacer, or you are using a CRT TV then potentially this method can give the best results of all. There are many restrictions on its use. You must setup X with an interlaced display mode that matches the content resolution (at least in the vertical). You cannot use scaling or time stretching. Attempt to recover additional spatial information by looking forward and/or back in the video stream. GreedyH looks only at the prior field, while Yadif looks both forwards and backwards. Note: If using a Nvidia TV output (composite/svideo) & watching PAL/NTSC signals there should be no need to deinterlace video because the TV output's flicker filter's default setting (of 127) makes interlaced material look perfectly natural - exhibited on FX5200 svideo output - YMMV. All deinterlacers are hardware assisted, except "none." Temporal and Advanced are best, but Advanced requires heavy resources and may only work for you on 480i SDTV, not on 1080i. Reports are that this deinterlacer will work with 8400gs or 9400gs Nvidia cards for 1080i. The Advanced 2x deinterlacer is thought by many to be the best, however it requires an GeForce 8600 card in the 8x series (The 8800 does not support VDPAU) or a 9600 or above. Reports on the 9500 are not available, but it is likely to work. Note that for some configurations, such as the ION chipset, you may see tearing even with VDPAU enabled. This can be because there is "Composite" processing going on in parallel which is unnecessarily stealing away performance in the GPU. This can be disabled in X11 xorg.conf configuration for VDPAU.